Order one for each MO office and location to be fully compliant. 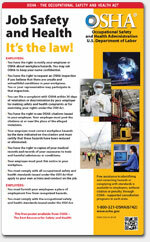 The OSHA poster is included on the Missouri Complete Labor Law Poster. When you order the Missouri Complete Labor Law Poster, it will satisfy your State, Federal, and OSHA posting requirements with one poster. 11/2018 - Minimum Wage Poster - Revised to include new 2019 minimum wage rate of $8.60, as well as a reworded section on employee rights and those exempt from the minimum wage law. 02/2018 - Unemployment Insurance - Poster was completely redesigned with new sections to explain when and how to apply as well as how to properly classify workers in Missouri. In addition, a new e-mail address, fax number and revision date were added. 12/2017 - Minimum Wage Poster - Updated to reflect new 2018 minimum wage rate of $7.85 effective January 1, 2018. 11/2016 - Minimum Wage Poster - Updated to reflect new 2017 minimum wage rate of $7.70, effective January 1, 2017. 05/2017 - Workers' Compensation - Update includes additional text regarding occupational diseases and updated felony classes for fraud and noncompliance. 11/2015 - Minimum Wage Poster - Updated with new calendar year. 03/2015 - Unemployment Insurance - Update to unemployment insurance poster, minor revisions includes new instructions for filing automation and new TDD/TTY numbers. 07/2014 - Unemployment Insurance Poster - Updated to include additional telephone numbers for translation services. 03/2014 - Workers' Compensation - Update to Workers Comp, changes include replacement of OSHA as agency in charge of work Safety program w/ Missouri Workers Safety Program. Many industries such as the restaurant, retail, construction, and professional use the Missouri Complete Labor Law Poster to satisfy their compliance requirements for State, Federal, and OSHA. When posted in an area frequented by employees, the Missouri Complete Labor Law Poster puts a business in full compliance. Federal contractors and subcontractors are required to display more postings in addition to the general State, Federal, and OSHA regulations. Please click here to see the federal contractor and subcontractor posting requirements. Ensure your full compliance by posting the Missouri Complete Labor Law Posters with the federal contractor-required postings.